While the ultimate goal in NASCAR racing is winning, reaching the 750-horsepower level is a victory in itself. The accomplishment is attained through the skills and acumen of engine builders who thrive on continually finding ways to produce more speed. But their ingenuity makes them victims of their own success. A case in point is when NASCAR mandated a lower engine compression ratio beginning in 1998. The ratio, which measures the pressure created in the cylinder by the upward movement of the piston, was reduced from 14.0:1 to 12.0:1. The goal in slowing speeds, according to NASCAR, is to cut horsepower and enhance competition. Danny Lawrence, Head Engine Builder (for the No. 3 Monte Carlo, Goodwrench Service Plus NASCAR Winston Cup Series car), Richard Childress Racing, recalls it wasn't very long ago that there were no compression limits. "A couple of years ago (five to be exact), we had no compression ratios," Lawrence recounts. "They (NASCAR) would let you run whatever compression ratio you wanted to run, but the octane in the fuel determined a lot of the compression ratio you got. You get into detonation and all kinds of other variances when you run unlimited compression." He explains the 12.0:1 compression ratio limit may continue to drop, and that the reason for further reductions involves emissions issues. "They've started dropping the compression ratio because NASCAR is leaning toward unleaded fuel. From what we understand, they are going to start going lower, so that we can start running unleaded fuel. We should know toward the end of this year - NASCAR might even go to 11:1 or 10:1 next year. The reason they're doing that is so that we can start running unleaded fuel for the emissions." "Whenever they make a rule, everybody works really, really hard to get back to where they were or even better. We're still searching for what is the best." The compression ratio is achieved in different ways by the various teams. Lawrence explained: "When they dropped it, everyone had to go back to work. Some teams use what is called a 'reverse dome' where you don't have a pop-up piston or a flat-top piston - it means you have a dome in your piston." Pistons are custom made, and most NASCAR Winston Cup teams have their own piston design. It's an evolutionary, detail-oriented process to achieve the best formulations, says Lawrence. "We're going through different combinations right now to see what we need with different types of cylinder heads," added Lawrence. "You can't just say, a reverse dome works really good with this type of cylinder head and this cam. You have to keep going back through it every time you make a change, as one phase of the engine affects another phase. "We revisit that stuff all the time. You never give up on it. Just because it didn't work then, doesn't mean it's not going to work now. If somebody finds a little something here, and you're not looking in all those areas, you could get behind really, really quickly." Beyond meeting the challenge of staying within the engine compression ratio limit, NASCAR Winston Cup Series teams still manage to eke out a few more horsepower, here and there. After all, the race car engine is where races are won or lost, and any advantage gained can make all the difference in giving a team a competitive edge. Yet the more compression you put into an engine, the stronger you have to make the components to withstand the stress. Preventing engine failure, therefore, is a primary consideration and goal in building a NASCAR Winston Cup Series engine. "With more compression, you have to have stronger rods and stronger pistons - the beefier all those parts have to be," he explained. "We're pretty much on the cutting edge on the strength of the pieces. We try to run the lightest components that we can, which will actually turn the engine up quicker, yet they are durable enough to finish the race. So you don't want a real heavy piston, or a real heavy rod in that thing, that you don't really need." Achieving the right compromise requires intensive testing, and extensive research and development. "We stress test the rods and the pistons, and we use the lightest components that will not fail," said Lawrence. "You can build that thing where it will never break, and you wouldn't ever have any trouble with it, but it won't turn up the RPMs. It is sort of like walking on thin ice - you want it (components) as light as possible, but where it won't break." Post-race analysis and testing are big factors in component development and refinement, as they reveal key information on the level of stress that engine components undergo. "We are constantly changing our pieces to try to make them better. When we disassemble an engine, we inspect it just like we do when we put it together to look for stress, and we have a process to tell how much torture the pistons and the rods have taken," explained Lawrence. "We also send stuff out to metallurgists who do stress tests. You can tell by looking at the bearings and looking at the pistons, how hot it's been and how much torture it's taken." Engine component stress comes in varying degrees of intensity as dictated by track variances, according to Lawrence. "Different race tracks put different kinds of loads on the engine." He gave the example of equipping a race car bound for Atlanta Motor Speedway with stronger components because the RPMs don't fall down as much on that track, compared to running at Bristol Motor Speedway, where there isn't near as much of a load put on everything. Lawrence compared the component configurations of a race engine and a qualifying engine and the horsepower differences therein. "Generally a lot of the teams' qualifying engines will be 20-25 horsepower more than what their race engines are because of the lightness of the pieces that are inside it." He explains that a qualifying engine can have a little rougher cam, and lighter weight pistons, crank and rods, but those things would never last in a race. Everyone knows that. Input from a NASCAR Winston Cup Series driver is critical to a team's research and development processes, so much so that in-the-field comments are analyzed at weekly team meetings. Detailed information about a car's performance are factored into strategies for future races at the same track. "A lot of times we'll go to the race track with different combinations.....like the No. 31 car had this kind of engine, and the No. 3 car had this kind of engine, so we get the driver input," explained Lawrence. For example, "Dale Earnhardt says the engine ran really good from the flag stand on, and then Mike Skinner says my engine ran really good from the center of the corner to the flag stand. So, we come back and put the car on the chassis dyno or the engine back on the race dyno and we'll run those engines against each other. We try to figure out what would be best for that race track when we go back. It's a never-ending thing. You never stop tweaking and you never stop trying to find that horsepower or that torque . It's a continuous thing and you never give up on it. You can always get better." Perfection doesn't come overnight, nor without keeping your eyes and ears open, alluded Lawrence. "We're looking down the road. We're always planning for the next three months. All of this stuff is custom made, so when you decide that you're going to run a different type of piston, you just don't decide today that you can do it tomorrow because this stuff has to be built, and it takes time. "We're always looking at what everybody else does. Someone will call and say I've got the latest carburetor. We get it in here and you have to look at that kind of stuff. You can't give up on anything; there is no end." All of the expertise, hard work, and research and development that goes into preparing a NASCAR Winston Cup Series car for race day must pass one final test - that of the NASCAR Officials who give the engines a final "thumbs up." Starting with the carburetor, then working down through the manifold, NASCAR Officials end up by verifying that the vehicle's engine compression ratio is within the legal limit - 12.0:1. They use a "P&G pump" to check the engine displacement, then they feed that information into the "whistler" which measures the engine compression. It actually measures the volume of the combustion chamber by sound waves. A thermometer is also used to check the engine, providing yet another number that is added to the whistler as a pre-race check. All teams' race and qualifying engines are whistled and P&Gd on race day, before any of the race cars are allowed on the track. The entire inspection, which Lawrence says takes under 10 minutes if the team is prepared when the NASCAR Officials get there, is quite scientific. Lawrence runs through a typical engine compression inspection. First, NASCAR Officials appoint a cylinder that will be checked. There is a board on the NASCAR Winston Cup Officials trailer that says, for example, 'P&G second cylinder on the right side,' he explains. For the NASCAR Officials to check engine displacement, "What you have to do is pull all of the spark plugs out of the engine, pull the valve covers off and take the two rocker arms off of the cylinder that they designate," explained Lawrence. "They (NASCAR Officials) have a gauge that they screw into a spark plug hole. They then put a hose to that gauge and spin the engine over, and what it does is it reads how much velocity of air comes out of that cylinder. If you have a really big engine and it pumps more velocity of air out, they can pretty much tell. That's what they call P&G, which stands for pump and gauge." This data is then fed into the whistler to determine the engine compression, says Lawrence. "What you do is you pull your engine up to top dead center (TDC), and usually you'll put your engine a couple degrees before TDC. The whistler goes in that same hole (mentioned above) and, with the valves closed, it reads how much area you have with the piston at TDC. It pumps air into the cylinder and pulls air back out of the cylinder, and it tells how much area is in there." Lawrence adds that the NASCAR Officials take the P&G number (i.e. the motor is 356 cubic inches), and the formula they get from the whistler, and they put that in the whistler (356 and the temperature, and how much air flows in and out of the engine with the piston at TDC), and it roughly tells them the engine compression ratio. The readings obtained from this inspection are close, but not totally accurate, says Lawrence, because the process is affected by carbon and the outside temperature. "But, it gives them a really close reading without tearing the engine apart." An engine tear down is not improbable, however, even though an engine builder signs off on the engine, indicating it is legal, says Lawrence. "If they see something that is out of the norm, for example, after qualifying or after the race, everyone's engine whistles 11:4 or 11:5 and mine whistles 12:1, they'll make me tear that engine down after I use it and then they'll check to see why it's different. They don't just let you off the hook." There's no comparison between the power and efficiency of a NASCAR Winston Cup Series engine and a factory production engine, not to mention that NASCAR Winston Cup cars still use carburetors, and today's new cars are fuel-injected. But some similarities do exist. For example, NASCAR Winston Cup Series cars' engine specs mirror those of a factory engine, including the number and angle of the cylinders, the location of the camshaft, the number of valves per cylinder, the number of intake and exhaust ports, and the location of the spark plugs. 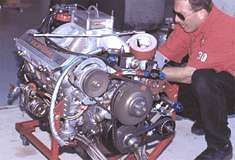 And while they are miles apart in terms of horsepower and performance, when you consider a NASCAR Winston Cup engine produces more than 700 horsepower, compared to a typical street vehicle that runs in the 200-horsepower range, the principles governing their upkeep and maintenance should run parallel. Even though your customers' engines won't be pushed to achieve designated horsepower goals, they still need to run efficiently and perform at their peak. Meeting your challenge of keeping them well-tuned and in top-running condition will hit your goals of satisfied customers and no repair comebacks.